The 18-90x88 WP Benchmark Spotting Scope from Barska is designed for shooters and nature explorers. This straight-viewing scope comes with an Accu-Grip mount that can be attached to the tripod thread of the scope, allowing its use as a handheld spotting scope, or it can then be attached to a tripod head and utilized as an extension and grip of the combined scope and tripod. The Accu-Grip handheld tripod mount can be used with any spotting scope, binocular, or video or photo camera that has a standard tripod threaded mount. The 18-90x88 WP Benchmark also comes with a tabletop tripod, a soft carrying case, and a key-lockable hard carrying case. 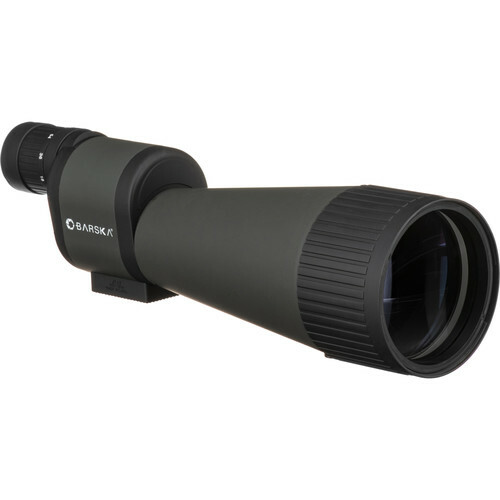 The large objective, fully coated optics, zoom magnification, and user-friendly focusing by turning the objective give this spotting scope a profussion of features at a very reasonable price. Box Dimensions (LxWxH) 15.4 x 8.3 x 7.0"
18-90x88 WP Benchmark Spotting Scope (Straight Viewing) is rated 4.5 out of 5 by 2. Rated 5 out of 5 by Gutz from Spotting Scope, Great price! Great spotting scope for the price! love it!